Welcome! 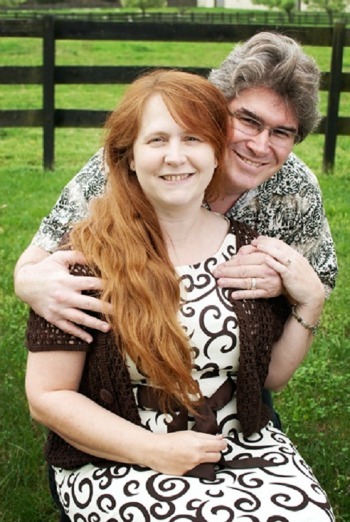 This month’s newsletter features an overview of using Twitter to support your blog’s ministry, an invitation to an essay contest, and a behind-the-scenes look at Jason and Tiffani from My Beloved Is Mine! Some of us do a lot of planning for our blogs, and others of us wait for inspiration. There is no one right way to do what we do. We all work in our own ways with the gifts God has given us, and sometimes it may be hard to see which direction to take. Remember that it is all in God’s hands. 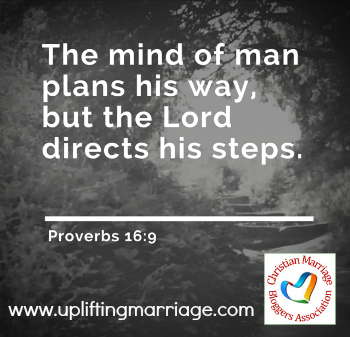 Even with our blogs, God will direct our steps. Thank you for being a voice that encourages people to grow in their marriages. If you have written e-books, what system did/do you use? Why? Weigh in on this thread in the forum to share your experience for the rest of us. If you would like to try your hand at writing about marriage somewhere other than your blog, here’s your chance! Creative Nonfiction magazine is seeking unpublished essays about marriage. Essays must be previously unpublished and no longer than 4,000 words. There is a $20 reading fee, or $25 to include a 4-issue subscription to Creative Nonfiction (US addresses only). The deadline is August 31, 2015. Creative Nonfiction will award a $1000 prize for the Best Essay and $500 for the runner-up. Contest information is available at https://www.creativenonfiction.org/submissions/marriage. Use Twitter for My Marriage Blog? Do you have an e-book, devotional, printable, or other resource that you’ve developed? Let us send a little love your way. If you have a resource that you’d like help promoting, send an email to Chris at chris@forgivenwife.com. Resources will be listed in future newsletters. It’s a great way to help us encourage each other and see what we’re all up to. Meet Jason and Tiffani from My Beloved Is Mine! We are Jason & Tiffani Graves, married on August 28, 1987 – my 21st birthday. We started the “SongSix3 – My Beloved Is Mine!” blog in February 2012. We were beginning to come out of a time of awakening between us. We had both sinned egregiously against each other (in the form of adultery) roughly a decade earlier, but had each chosen to keep it a secret – not realizing that we could never have true intimacy until we were finally honest with each other. That time period broke in July 2011. The next 7-8 months were very rough as we traversed that minefield of emotions, but our senior pastor walked through the whole mess with us. Jesus taught us what it truly means to forgive. Tiffani showed me the marriage blogs of a few people, as I had no clue there were people doing this on the web. I remember specifically reading some posts from Julie Sibert and Brad & Kate Aldrich, and being very impressed at the work they were doing. The idea for our blog began to take shape in my mind. There are already experts out there teaching in niche areas, and we feel those folks are doing a good job. So our blog doesn’t concentrate necessarily in any one area of marriage. Our earlier posts were kind of zeroed in on telling our story of adultery and dishonesty about it, but we have long felt the need to be more diverse and talk about things that apply in all areas of the marriage. So you’ll find posts about adultery, respect, body image, death of loved ones, kids, video gaming (within the context of marriage), and several other topics. You’ll even find a few posts woven throughout from our life around the farm! I truly can’t say I have just one favorite – but if you’ll allow me to share two, please? The first would be “Keep Short Accounts”. (http://songsix3.org/keep-short-accounts/) This one tells our back story in the most succinct way, along with the results of our sin and what we learned from it all. My other favorite is still my very first blog post, “The Most Beautiful Woman In The World.” (http://songsix3.org/the-most-beautiful-woman-in-the-world/) My Beloved wife struggled with body image so much, and I needed to find a way to SHOW her that I didn’t see what she saw in herself. I had fun writing this one, but the core message is still a serious one that most women struggle with at some point in their lives. The fact that writing does NOT come easy! We post so infrequently because neither of us are very prolific writers. Tiffani definitely has more ideas than I for posts, but she’s a homeschooling, farm-managing mom… time is NOT something she has a lot of! Speaking for myself, I often have something going in my head about marriage, but when I try to put pen to paper (or fingers to keyboard) I most often come up blank. It is a point of frustration for me. Tiffani and I got married very young. We were not Christians at the time, and really didn’t even acknowledge God at all. We had a rocky 1.5 years together, and then we split for almost a year. During that year, Christ got ahold of both of our hearts even though we were living on opposite coasts of the U.S. He got us back into the same room together and we both just KNEW that we were supposed to reconcile. We had a rough time trying to learn how to be Christians AND married all at the same time, without any real spiritual guidance – but we managed. Several years passed and thanks to wishy-washy lackluster walks with Christ, we each fell into sins (and silence) that would put a dark cloud over us for over a decade. 2011 was the year that the cloud was blown apart and the light of Jesus was able to shine in. We have spent the last 4 years learning to speak clearly and directly with each other, praying for and with each other, becoming the best of friends, and building REAL intimacy between us. We have six children ranging in age from 29 down to 7. (Yes, they are ALL ours!) Our two oldest children also have kids of their own, so we are grandparents to 4 bouncing little ones. We will celebrate our 28th year of marriage in two months. We have been locked in to the fellowship at Calvary Chapel of Manassas (Virginia) since 1998, and I lead worship & play electric guitar. Tiffani sings with the team as a backing vocalist. It still amazes and dumbfounds us that we get emails from every corner of the earth. “We got a blog reader from WHAT country?? ?” People write to us looking for hope. They want to know what magic formula we used to get past the hurts of the past. Some of these folks are in some SERIOUSLY screwed-up situations too. It breaks our hearts to hear about the love triangles (and in some cases quadrangles) that people get themselves mixed up in. But we always respond to them the same way… there is NO magic formula. You need to submit yourself to Jesus, and learn to serve Him no matter what happens in your marriage. Psalm 37:4 says “Delight yourself in the Lord and He will give you the desires of your heart.” No, that’s not a guarantee that God will restore your broken marriage (although we will certainly agree with you in prayer that He DOES!) What this verse says to us is that God already knows you desire to be loved by another human in total intimacy. After all, HE put that desire in your heart. So serve Him while you wait. He has not forgotten you. 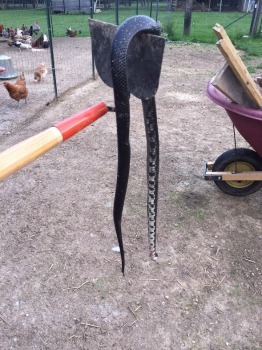 Jason killed a snake on their new farm. 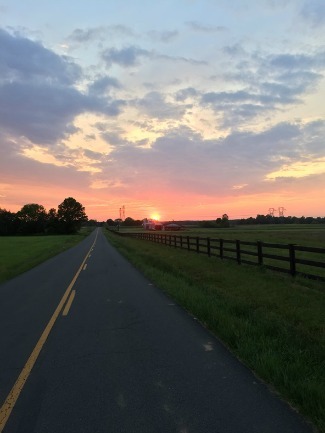 In 2011, we city folks decided we wanted to move our four homeschooled kids into the countryside and attempt to get a bit more peace into our lives. We purchased a 2.5 acre farmette and successfully raised up a great flock of egg-laying chickens, several batches of hogs (fresh pork, anyone?? ), and a whole mess of meat birds that have served us many great meals from the roaster. Two months ago, we upgraded to a 10-acre farm (http://songsix3.org/new-family-farm/) which we share with Tiffani’s step-dad. There are two houses on the property, so he’s got his own space. We have moved our chickens & ducks to the new place, and recently had a local farmer drop off two one-year-old cows that will provide fresh beef later this year. Tiffani is a fantastic farm manager, and runs the place like she’s been doing it her entire life. I am a SharePoint Administrator and computer support guy all day, but my evening job is “farm hand”. I do whatever “the boss-lady” needs done. I’ve become quite proficient at snake hunting. Snakes love chicken eggs, but unfortunately for them, my family loves the eggs more. I won’t go into the gruesome details out of respect for the squeamish, but suffice it to say that although I’ve been involved in many-a-battle against nature, each time only one of us has made it out alive. I have survived to blog another day.